Cambodia does not produce pesticides and all agricultural chemicals must be imported, and there are no important agrochemical distributors in the country. Pesticide management is high on the agenda of the Government of Cambodia. A number of reports that pointed at the broad availability and use of highly hazardous pesticides has accelerated government initiatives to tighten pesticide regulation. Several regulations and a pesticide registration system have been established. However, effective enforcement of the regulations remains a challenge that needs to be tackled soon. The Ministry of Agriculture, Forestry and Fisheries (MAFF) is responsible for the management of pesticides in the country, which has two main institutions that play an important role as implementing authorities. Under DAL there is a Bureau of Agricultural Material Standard (BAMS), which is responsible for registration for agricultural materials in Cambodia. With technical advices from concerned institutes, it acts as assisting unit for MAFF that is responsible for registering and enforcing measures to control the quality of Agricultural Materials such as pesticides, fertilizers, seeds and planting materials, veterinary medicines, feed stuffs and feed additives. To register and issue the permission of Agricultural Material exploitation. To register of annul the registration or revoke the permission of Agricultural Material exploitation. To promulgate guideline on registration of Agricultural Materials. To establish quality standards according to the specifications of each Agricultural Materials exploitations. To control Agricultural Material exploitations. To cooperate with concerned ministries, to determine and control the Agricultural Material exploitation and their compounds. DAALI is responsible for technical advice to BAMS for registering and enforcing measures and managing the use of pesticides in the country. The Plant Protection and Phytosanitary Inspection Office (PPPIO), structured under DAALI, is responsible for implementation. To prepare regulations and legislation on the management of pesticides and phytosanitary measures. To educate farmer and stakeholder on pesticide uses and plant protection measures. To supervise the Pesticide Formulation Analysis Laboratory, Pesticide Residue Analysis Laboratory and Plant Diagnostic Laboratories. Other institutes concerned with the management of pesticides are the Department of Animal Health and Production with its responsibilities, Ministry of Commerce, Health and Environment. Moreover, there are many NGOs that take an active role in pesticide uses such as Centre d'Etude et de Development Agricole Cambodgien (CEDAC) working closely with farmers in raising awareness on side effects of pesticides and its alternatives and NGOs Forum is expanding activities to the whole country with the aim of reducing pesticide dependency. Sub-decree (No. 69) on Standard and the Management of Agricultural Materials issued 28 October 1998 contains 14 articles mentioning the pesticide management procedures. l Ministerial declaration (No. 038) on the creation of the Bureau of Agricultural Material Standard issued 21 January 1999. Ministerial declaration (No. 245) on the implementation of the Sub-decree No. 69 issued 21 October 2002. Ministerial declaration (No. 064) on Formats of Application Forms relating to Agricultural Materials issued 27 February 2003. l Ministerial declaration (No. 522) on the Mandate of the Department of Agronomy and Agricultural Land Improvement issued 30 September 2003. Ministerial declaration (No. 598) on the Lists of Pesticide in Cambodia issued 15 December 2003. Ministerial declaration (No. 204) on Amendment of Declaration No. 064 issued 12 July 2004. Mutual declaration (No. 02/04) between MAFF and MoJ on Formats and Police of Justice for MAFF/DAL issued 26 October 2004. Integrated Pest Management (IPM) program was initiated in 1993 by MAFF after a National Workshop on "Environment and IPM". In 1998 MAFF officially declared Integrated Pest and Crop Management as one of the country key crop production strategies with the aim of making IPM the standard approach to crop management. This aim to make IPM the standard approach to crop management in Cambodia, with emphasis on rice, vegetables, fruit and field crops with pursuing a policy of sustainable food production to ensure food security in Cambodia. Further, on the 4th of July 2002, MAFF issued a Ministerial declaration (Prakas) No. 205 on the establishment of an Integrated Crop Management Program, called "National IPM Program" to facilitate coordination of all IPM activities in Cambodia irrespective of donor agencies and crops involved. The overall goal of the program is to improve food security through the promotion of Integrated Pest and Crop Management skills at the farm level. The National IPM program is structured under MAFF and is now working in 14 provinces with major agricultural production. To reduce farmers' dependence on the agricultural chemicals, especially pesticides in agricultural production and to minimize hazards to the human health, animals and the environment. To develop the capacity of farmers and agricultural technical officers to conduct training and experiments to be able to identify problems and find appropriate solutions. To educate farmers on agricultural technologies by enhancing their monitoring and analyzing field situations enabling them to manage crops effectively. The program has adapted the strategy of "learning by doing" using the Farmer Field School (FFS) model and the training methods are based on the principles of non-formal adult education with emphasis on a discovery learning approach. This approach allows farmer to participate in a season long training covering one full crop cycle with intensive field practice. To support the training exercise, a crop is grown for field study activity. Farmers observe and analyze the field situation to discover the dynamic relationship between plants, pests, natural enemies, nutrients, soil, water and other components in the crop ecosystem. After thoroughly analyzing the field situation, the participants discuss findings and together make decisions about crop management. In addition, the Program coordinates with research institutions to find new agricultural technologies and good experiences in response to the needs of the farmers. There is insufficient research on pest resistance to pesticide in Cambodia. However, many reports concluded that insects have developed resistance to pesticides in Cambodia. Many reports published that many agricultural materials sold in the Cambodian markets are illegally imported and fake or substandard in quality. Some of these products are pesticides banned for use in Cambodia as well as in other countries due to their harm to health and the environment. To improve this situation, the Royal Government of Cambodia (RGC) particularly Ministry of Agriculture, Forestry and Fisheries (MAFF) introduced legislation and regulation to control pesticide in country. On 28 October 1998 the RGC issued a Sub-decree No. 69 on Standard and the Management of Agricultural Materials aiming to guarantee consistent high quality agricultural material inputs especially for management of pesticide. Chapter III of this Sub-decree contains 14 articles, (11-24) mention about pesticide management, which was detailed in Annex 1. For implementing the Sub-decree above, MAFF made a ministerial declaration (Prakas) No. 038 on the creation of the Bureau of Agricultural Material Standard to response the registration of agricultural inputs, issued 21 January 1999. Its functions and duties are described in the introduction above. In order to implement Sub-decree No. 69 efficiently and effectively, MAFF also developed Prakas No. 245 issued in detailed guidelines for implementation on 21 October 2002. This Prakas details the procedures on how to register products, exploitation, import and export, register or revoke the permissions, packages and label, disposal of empty container, selling, prohibition of exploitation, advertisement, trader obligation, and control and management of officers. In addition, MAFF further created a Prakas No. 064 on Formats of Application Forms relating to Agricultural Materials issued on 27 February 2003 to standardize forms used in the country. This Prakas develops unique application forms for use by all distributors or importers. Subsequently, MAFF issued another Prakas No. 598 with Lists of Pesticide in Cambodia on 15 December 2003. This declaration contains three lists of pesticides such as pesticides banned for use (116 common names), pesticides restricted for use (40 common names) and pesticide permitted for use (136 common names) (see Annex B). In this regulation, pesticides classified as banned and restricted conform to WHO classification by hazard (Ia and Ib) and some pesticides are recently concerned with environmental pollution. Lists of pesticide are normally updated every two years. Since Prakas No. 064 had not enough procedures to implement pesticide management properly, MAFF developed a Prakas No. 204 on Amendment of Declaration No. 064, issued 12 July 2004. Even thought, all Prakas above still give no power to enforce pesticide management. Under the mutual declaration No. 02/04 between MAFF and Ministry of Justice (MoJ) on Formats and Police of Justice for MAFF/DAL/BAMS officers, issued 26 October 2004, officers and staff are being trained by resource persons on procedures how to take action against violation. Full implementation will be done in year 2006. For controlling the pesticide quality, MAFF currently has one Pesticide Formulation Analysis Laboratory supervised by DAALI and implemented by PPPIO to monitor quality of pesticide products in country. However this laboratory has limited facilities and technicial capacity. Most product samples analyzed were from imported pesticides or distributors officially registering their products in MAFF/DAL/BAMS and some pesticides on sale in the markets. Only 55 samples of pesticide products were analyzed in the year 2004. On the other hand, PPPIO has further made trials on pesticide effectiveness in the field. 45 sample pesticides were tested before officially registered by MAFF/DAL/BAMS. There is no collaboration between industries and the government to monitor pesticide use in the field, however there is a program called "Safe and Responsible Use of Pesticide" (SARUP) to raise awareness of farmers on pesticide application and safe protection. There are still not enough data to identify the impact of pesticides to human health and the environment. Cooperation between MAFF, MoH and MoE initially conducted an inventory on POP pesticides (Persistence Organic Pollutants) focusing on the production, use, stockpile, contaminated sites in country. Result found that no production, stockpile and contaminated site of POP pesticides in country but there are some DDT and Chlordane remains on sale in the markets. However, they do not have records on the impact to human health and the environment (MoE, 2005). Regular surveys done by PPPIO on pesticide use by farmers and pesticides on sale in the markets found that the areas of heavy use and sale of pesticides is the area located on both sides of the Mekong River and the Tonle Sap Lake. 109 common names with 419 trade names of pesticide were available in the markets in year 2004 and all farmers who grow vegetables and beans in above region used pesticide seriously (PPPIO, 2004). Furthermore, a few survey done by local NGOs on occupational poisoning among farmers showed that 96 percent farmer interviewed had experienced at some point symptoms or signs consistent with those of acute pesticide poisoning during or shortly following the use of pesticide (CEDAC, 2004) and similar results were researched by Sodavi et al., (2000). In addition, there is a collaboration research done by Ministry of Agriculture, Forestry and Fisheries of Cambodia and the Department of Environment Conservation, Ehime University, Tarumi, Japan on Persistent Organoclorine Residues in Marine and Freshwater Fish in Cambodia. Results showed that DDTs, HCHs, CHLs, and HCB were detected in fish samples collected from inland and coastal water. DDTs were the predominant contaminants with concentrations ranging from 0.5-25 ng/g wet wt, HCHs, CHLs and HCB accumulated at lower levels in fish ranging 0.01-0.22 ng/g, 0.1-0.34 ng/g and <0.01-0.32 ng/g respectively (In Monirith, et al. 1999). Ministry of Environment is responsible for monitoring environmental quality (air, water, and soil), controlling environmental pollutants release, and participates in collecting, compiling, and managing data related to toxic and hazardous chemical and managing all kinds of waste in terms of a safe environment. But they have no program to monitor or research on the effect of pesticide to human health and the environment. Similarly Ministry of Health has its mandate to treat and prevent human health but they have no specific programs to monitor the impact of pesticide yet (Mandates of MoE & MoH). Cambodia has created a National Codex Committee (NCC) to standardize all commodities for export by Sub-decree No. 05 issued on February 1998 and amended by Sub-decree No. 28 issued on March 2001. Ministry of Commerce is a focus point of this committee with other ministries as member (MoC, 1998). No progress of this committee. It is difficult to describe the trend in pesticide manufacture, use and trade in Cambodia. So far Cambodia does not produce or export pesticides but imports predominantly from abroad with legal and illegal permissions from Viet Nam, Thailand, China, Malaysia, France, Singapore and Taiwan etc. A system has been established to registe pesticides in Cambodia as well as to collect or record data on pesticide importation. However, few data were recorded in some institutions of government. Besides these, pesticide importation also occurred by illegal importers along the uncontrollable borders of Cambodia. A survey done by local NGOs estimated the value of farmer expenditure at about 20 000 000 USD every year (CEDAC, 2004) and approximately 6-9 million dollars every year (Environment Justice Foundation). Effort made by the government to reduce risks associated with pesticide in term of toxicity, packaging, labeling and application method is the establishment of legislation and regulations as mention in point B. Furthermore PPPIO conducted a program "Safe Use of Pesticide" which aims to provide knowledge on selection and application of pesticides in the field, and prevention of pesticide hazards to human health and the environment. In addition a collaboration with other agencies conducting a program called "Safe and Responsible Use of Pesticide" (SARUP) with similar objective above to expand activities in whole country. SARUP program was initially established in 1995 by the DAALI and supported by Japanese International Cooperation Agency (JICA) for two years and then the Royal Government of Cambodia decided to allocate funds to continue this important program. Moreover, Crop Life Asia has recently supported a pilot program since year 2002. Moreover trainings conducted by local NGOs such as CEDAC and NGOs Forum on pesticide hazards and its alternatives to farmers who grown vegetables and cash crops located in major agricultural provinces around Tonle Sap Lake, Mekong River and areas of intensive use of pesticides along the border of Cambodia. There are small amounts of obsolete pesticides stocked in Cambodia. Approximately 25 tons of obsolete pesticides are stored in the warehouse of DAALI and they proposed for phasing out by a project cooperated with Ministry of Environment. (DAALI, 2004). Through existing regulations, Sub-decree 69 addressing that the disposal of waste and unwanted pesticides and empty containers should be permitted by MAFF and MoE but procedures to discard them have not been established yet. Although farmers dispose of their empty containers and left over pesticides in the field freely. In accordance with legislation and regulations of RGC, producers or importers must follow the system of registration formatted by MAFF/DAL/BAMS. In fact 8 Prakas above continually issued are proven. License to doing business in pesticides: Any physical or juridical person who did, does and whishes to produce, formulate, repack, stock, supply, import-export, sell and resell shall obtain the permission from MAFF/DAL/BAMS. License to location of warehouse: Procedure and condition for storage of pesticides shall be regulated by MAFF. The location of warehouse for pesticide shall be permitted by MAFF with agreement of MOE. License to disposal: The disposal of waste and unwanted pesticides and empty containers should be permitted by MAFF with agreement of MOE. The advertising of pesticide shall be regulated by MAFF. License to import pesticides: any physical or juridical person may not be allowed to import any kind of pesticide unless it has been registered and the person himself has obtained the permit from MAFF. The import permit is valid for a period of one year from the date of issue. The quantity of pesticides allowed to import shall be determined by MAFF based on storage condition, stock warehouse ability, local demand and avoiding a negative impact on the environment due to expiry, unwanted or obsolete pesticides when disposal. No pesticides shall be manufactured, imported, formulated, repacked, distributed, sold or offered of sale, used unless it has been duly registered by MAFF/DAL/BAMS. Provisional registration shall be granted to all pesticides listed in the provisional clearance by the MAFF and are sold in the market. Conditional registration is granted when there are data requirements or conditions that are still to be met by the applicant, such as results of local efficacy studies and/or on the acceptability of the pesticide in terms of quality and indication of safety as required by the MAFF. Full registration is granted when the applicant has satisfactorily completed all the technical requirements regarding bio-efficacy, protection of the environment, safety in humans and animals. Experimental use permit is a permit granted to research institutions the importation of unregistered pesticide for research purposes. Any physical or juridical person violating the registration of pesticides shall be given a warning and the product shall be confiscated. The punishment shall be determined by court. Any physical or juridical person violating the permission of MAFF shall be given a warning and forced to correct within 7 days. The product shall be confiscated and punishment shall be determined by court for second offence. Any physical or juridical person who fails to do business adulterated or not in conformity to the guaranteed analysis in the registration shall be given a warning and the product shall be confiscated. The punishment shall be determined by court. Fully revocation of permission for second offence. Any physical or juridical person violating the packaging standard shall be given a warning and forced to correct within 15 days. Provisional revocation of permission for second offence. Any physical or juridical person who fails to provide safe handling, proper transport, storage or disposal of pesticide without permission from MAFF shall be given a warning and forced to correct within 7 days. Provisional revocation of permission for second offence. Regulations (Sub-decree and Prakas) have been issued and a pesticide registration scheme is being established. Plans have been developed for the enforcement of pesticide legislation, but still need to be implemented. Cambodia does not produce pesticides and all agricultural chemicals must be imported, and there are no important agrochemical distributors in the country. Many pesticides remain available on the Cambodian market place illegally and majority of pesticide imports are uncontrolled with most labels not in the national language as the same time as Sub-decree 69 issued lists of pesticide in Cambodia such as permitted, restricted and banned. National IPM program is operational and growing and and has resulted in a clear reduction in pesticide use. DAALI is establishing a pesticide formulation analysis laboratory to control current concerns about the quality of many pesticides on the local market and pesticides registered in MAFF. Plans exist for the establishment of pesticide residue analysis laboratory at MAFF. Broad recognition throughout government of the existence of health and environmental issues associated with current pesticide use practices. There is very limited data on actual health and environmental effects of current pesticide use practices but there have been some data on occupational poison among pesticide users. Drinking water and food crops are currently not tested for pesticide residues. In the absence of such testing, there remains uncertainty about the food safety situation. Design and implement a program to enforce the requirements of Sub-decree 69 and Prakas. This would require strengthening of capacities at BAMS. Priorities include ending the sale of banned pesticide, and ensuring labels in the national language. National importers/distributors of pesticide should ensure that labels in national language are attached to individual packages. - Abide to the requirements of Sub-decree and Prakas. They should not import or distribute products that are on the government list of banned pesticide. - Importers should have appropriate pesticide storage facility. - Distributors should have basic knowledge about products, risks and proper management of products. Organize workshops for importers/distributors to understand the legal requirements and procedures. DAALI, National IPM and NGOs should step-up awareness of farmers regarding risks of pesticides through media campaigns. Strengthening capacities of facilities and staff of pesticide formulation laboratory to operate well-functioning laboratory in MAFF. Establishment of well-functioning pesticide residue laboratory in MAFF and aim for a national reference laboratory that can be used by the various ministries. Ministry of Health should be enabled to play a more significant role in researching and addressing pesticide associated health problems. The establishment of a Poison Control Center that provides instant advice on the treatment of poisoning cases would be a step forward. Ministry of Environment should be increased capacity to research pesticide hazards to the environment including the prevention of run-off of agricultural pesticides into waterway and management of obsolete pesticides. Strengthen international collaboration to align pesticide regulations with international requirements and measures taken in neighboring countries. H Vanhan (2004). Cambodian Paper on POPs Pesticides in Cambodia. N Chhay (2005). The impact of IPM programme in Cambodia. CEDAC (2004). Pesticide use and consequence in Cambodia. MoE (2004). National profile on chemical management in Cambodia. National Conference on Pest and Pesticide Management in Cambodia, 2005. PPPIO (2004). Annual report on pesticide use and market surveys. DAALI (2004). Report on obsolete pesticide in Cambodia. DAALI (2004). Report on primary inventory on POP pesticides in Cambodia. RGC (1998). Sub-decree No. 69 on Standard and the management of Agricultural materials. MAFF (1999). Prakas No. 038 on the creation of the Bureau of Agricultural Material Standard. MAFF (2002). Prakas No. 245 on the implementation of the Sub-decree No. 69. MAFF (2003). Prakas No. 064 on Formats of Application Forms relating to Agricultural Materials. MAFF (2003). Prakas No. 522 on the Mandate of the Department of Agronomy and Agricultural Land Improvement. MAFF (2003). Prakas No. 598 on the Lists of Pesticide in Cambodia. MAFF (2004). Prakas No. 204 on Amendment of Declaration No. 064. MAFF & MoJ (2004). Prakas No. 02/04 on Formats and Police of Justice for MAFF/DAL. MoC (1998). Sub-decree No. 05 on the Creation of Cambodian National Codex Committee. No pesticides shall be imported, manufactured, formulated, repackaged, distributed, sold or offered for sale, or used unless it has been duly, registered or given provisional clearance by the MAFF. Any physical or juridical person who did, does and whishes to do business in pesticide should register their product and obtain the permit in MAFF. 1. Pesticides that are not listed in the current MAFF list of permitted pesticide in use in Cambodia but are currently being sold. 2. 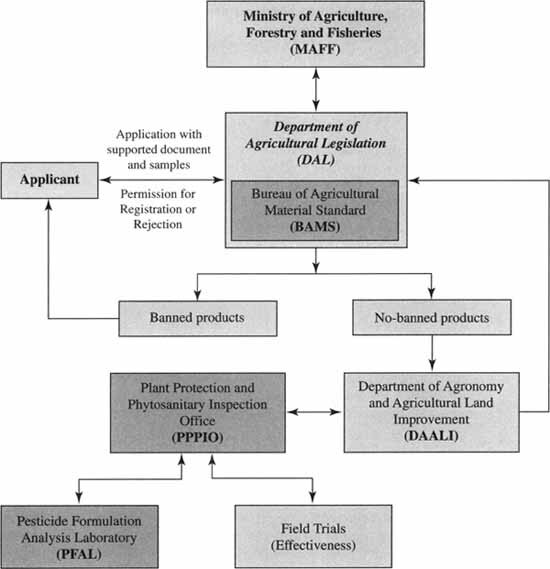 Pesticides those are included in the MAFF list of permitted pesticides. 3. New pesticides that do not belong to class I, according to WHO classification. 4. Registered pesticides with changes in formulation or trade name. Pesticides which are included in the MAFF list of banned pesticides, pesticides imported without permission from MAFF and pesticides belonging to Toxicity/Hazard Class I, according to WHO classification are not allowed for registration, except in case of emergency or for special purposes as determined by the MAFF. 1. Provisional registration shall be granted to all pesticides listed in the provisional clearance by the MAFF and are sold in the market. 2. Conditional registration is granted when there are data requirements or conditions that are still to be met by the applicant, such as results of local efficacy studies and/or on the acceptability of the pesticide in terms of quality and indication of safety as required by the MAFF. 3. Full registration is granted when the applicant has satisfactorily completed all the technical requirements regarding bio-efficacy, protection of the environment, safety in humans and animals. 4. Experimental use permit is a permit granted to research institutions the importation of unregistered pesticide for research purposes. A provisional or conditional registration shall be converted into full registration status within on year when conditions and requirements have been met satisfactorily. Extension for another year may be granted for valid reasons. Full registration shall be valid for a period of 3 years, unless earlier revoked or cancelled. A renewal for similar period may be obtained after submitting the appropriate fee and additional data when required. Failure to renew registration will mean automatic cancellation of such. The MAFF is empowered to charge fee for registration and renews with agreement of Ministry of Economy and Finance. Every container or package of pesticide offered for sale, storage and use shall bear a label printed in Khmer language and easy to understand. The format and characteristic of the label should comply with the labelling standard prescribed by MAFF. Pesticide container and related outer packaging should comply with the standards and regulations prescribed by MAFF. Repacking of a pesticide is prohibited, unless it has been permitted by MAFF. Decanting or dispensing of any pesticide in food or beverage containers is prohibited. Importation, production and sale of adulterated pesticide, damaged pesticide or pesticide which does not contain the quantity and type of active ingredient declared on the label or pesticide listed in conditional registration are prohibited. Procedures and conditions for storage of pesticides shall be regulated by MAFF. The location of warehouse for pesticide shall be permitted by MAFF with agreement of the Ministry of Environment. The disposal of waste and unwanted pesticides and empty containers should be permitted by MAFF with agreement of the Ministry of Environment. The advertising of pesticide shall be regulated by the MAFF. Only pesticides, which are fully registered, may be advertised.